The industry icon got his start with a rooming-house investment at age 18. 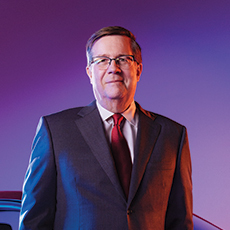 Like many in real estate, Craig Hall has had some wild swings over the past five decades. But Hall has proven that he has staying power. This past weekend, he gathered 500 family members, friends, and close business associates to celebrate 50 years in business. The event took place at his HALL Arts complex in the Arts District neighborhood of downtown Dallas. Among those joining Hall and his wife Kathryn (wine purveyor and former Ambassador to Austria) were Dallas Mayor Mike Rawlings, Frisco Mayor Jeff Cheney, Roger Staubach, Herb Weitzman, and Lucy and Henry Billingsley. Hall made his first real estate buy at the age of 18 not to make money, but to prove that one could be a “good-guy” landlord and still come out OK. He used his life savings—$4,000 he had socked away from various entrepreneurial ventures—to buy a small rooming house in his hometown of Ann Arbor, Mich. The success of that project led to another, and the rest is history. To mark the milestone, Hall has committed to provide $1 million in grants from the Craig and Kathryn Hall Foundation to help nonprofit partners invest in and support entrepreneurs. For more on Hall’s adventures in entrepreneurship, read this D CEO story from 2013.